Byley Field Target Club is a friendly club based in Cheshire. Byley FTC is a member of NWFTA, (North West Field Target Association). Competitions are regular hosted at the club grounds. Please see NWFTA dates on the Club Info page. 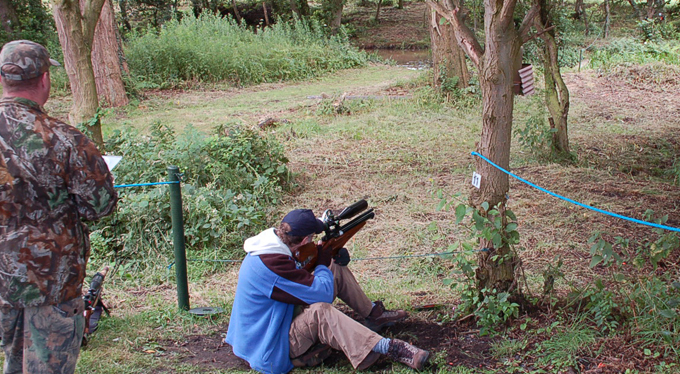 We aim to provide a safe shooting environment and promoting the responsible use of air rifles. All types of shooters are welcome, young, old, beginners to the more experienced and rifle types ranging from spring rifles to the more specialised pneumatic target rifles. From young'ens, to the not so young; all are welcome, (please note that if you are under 16 years of age you will have to bring an adult with you, who is over 21 years of age. This person must stay with you while you are shooting. The club has 2 members that are CRB, DBS checked by Cheshire police. on site car parking, a large air rifle plinking / airgun zeroing range, and a 30 target air rifle field target course situated in wooded grounds, an indoor toilet, hot and cold drinks facilities, food warming facilities, and a welcoming smile. Byley FTC at the Warmingham Summer fate, we always put on an a good shooting exhibition, and help to raise funds for the charity of the day. Byley FTC is a active supporter of Help for Heroes. Please read the club general rules and the clubs safety rules before shooting at Byley FTC.